How did that happen? Did any of our previous mayors, city administrators, police/fire chiefs, city councilors try to address the issue of deferred maintenance? Was it an oversight? No one’s saying. I think that’s irresponsible and I think it’s going to make it harder for the City to get taxpayers to belly up to the bar to fund something new. Pages 38-50 of the City Council Packet for today’s meeting has extensive background on the CIP discussion scheduled for tonight on both the Safety Center and the library. I’m inclined towards Option B. Option B. Re-use of Existing Facility for Police – New Location for Fire Facility. We were accompanied on the tour by Randy Jennings, Occasional Press LLC, and by David Drenth, a retired Building Official from Bloomington who’s moved to Northfield recently and volunteering his time to give tours. Jerry Anderson, member of the Safety Center Task Force and a member of the Northfield Rural Fire Association, will be a guest on our radio show/podcast today. Thanks for opening a discussion. So that you aren’t the only respondent to your own post, let me add a couple of things. In the spirit of disclosure, as part of the city council’s request for more public information about the safety center task force recommendations, I was hired to produce some background material summarizing the work of the task force, the several prior studies of the building, and the facility requirements of the police and fire department. The city had commissioned a number of these studies over the past few years. You’ll find pdfs of this material on the links you’ve cited. The opportunity to tour the current Safety Center isn’t just open to malcontents concerned citizens like you and Ross. We’d like to get any interested citizen or group of citizens to take a look at the building and see first-hand the conditions under which the police and fire departments work, and to assess the condition of the building. We’ve reached out to some of the service clubs, senior centers and other groups in town, but it’s by no means an exclusive process. To arrange a tour for any group of 4-10 (or so) interested people, please call Karen Mangold at the Northfield Police Department, 663-9315. There have been sparsely attended open house opportunities for individuals to tour the building in the past, and we’ll be planning one or two more in the next couple of weeks. When we get firm dates and times, I’ll post them here and in the Nfld News. Just one comment on the maintenance issues: over a couple of decades, plenty of people have been in decision-making positions about capital spending and improvements, or lack thereof. It’s not very productive to spend time assigning blame for this “irresponsible” behavior. We citizens have to accept some responsibility for not telling our council representatives that we expected them to protect our investments in civic infrastructure. If you own a home or a commercial building, you know there’s always something that needs attention and requires money. Why should city buildings be any different? If the council chooses to re-use the current building, it will take some serious engineering expertise to figure out what can be done. But any interested citizen can see for him- or herself the operational deficiencies of the building just by taking a tour. It’s an eye-opener for most people who haven’t had occasion to visit the building on official business. I just toured the facility this morning. Frankly, I didn’t see much “deferred maintenance” or “operational deficiencies”. The building seems quite solid, and capable. The quarters are really tight, but they are working. More space would be a definite plus. But, I didn’t hear of any problems which I would define as urgent or life-threatening. Both police and fire are getting the job done. That said, there is a need to find a way to get more space, and to get it at a reasonable price. The option that I would favor right now is building a new fire facility without any immediate changes to the police station. The police have been quite ingenious in getting maximum use of the current facility. I would like to see an analysis of what has to be addressed operationally, and take a hard look at solving each problem individually rather than trying to build a brand new state of the art building. One has to wonder why the City is giving tours of the facility when they are going to do whatever they want without listening to the citizens. The opportunity to tour the existing building is simply to provide people a chance to see first-hand the condition of a building that has been the subject of various studies and task force reports. You may not see a need to address long-term public safety issues, but others do. That the fact that the city council has now taken action with which you disagree doesn’t mean they’ve haven’t been and aren’t continuing to listen to the concerns of the people they represent. Really? This is the second time in several weeks that they adopted a recommendation that had no public support. I went to the open house last spring, but have not taken the tour of the office area, etc. The question of stewardship of a city owned building is a serious one, and this is not the first time it has arisen. The same issues of deferred maintenance were brought up as a reason to build a new liquor store; then when the building was repaired the costs to do that were a fraction of what had been stated. One must ask why an important physical facility has been let go to the extent it is claimed; I frankly doubt the veracity of those claims given the prior example. Another issue is one of factual space issues. I understand the crowding in the fire hall, and think it must be corrected for the safety of the firemen, and to make sure there is not a disastrous pre-fire run accident. However more than one of the people who attended the above mentioned tour attests to the number of offices in the police portion of the building that appeared to not be used (no papers or daily use items in evidence) while the halls are filled with storage boxes… True or false? Another question: What has happened to the portion of the Hay-Dobbs report (9.21.07) which shows an addition on the southern side of the current building, aligned with the highway, presumably on filled land(? ), but not in the flood plain area? Why is that option never discussed, in these times of economic insufficiency? Which of the council members understood that when the water dept engineers came to the council a couple weeks ago to get confirmation for building a “cold storage building”, its temporary use would be to house the fire dept? Over by the eastern water tower? and then where do the fire engines drive to get to a fire anywhere west of there, which just happens to be the entire city? That was NOT discussed at the “cold storage facility” meeting; it was presented as a long-term need for mechanical equipment storage. 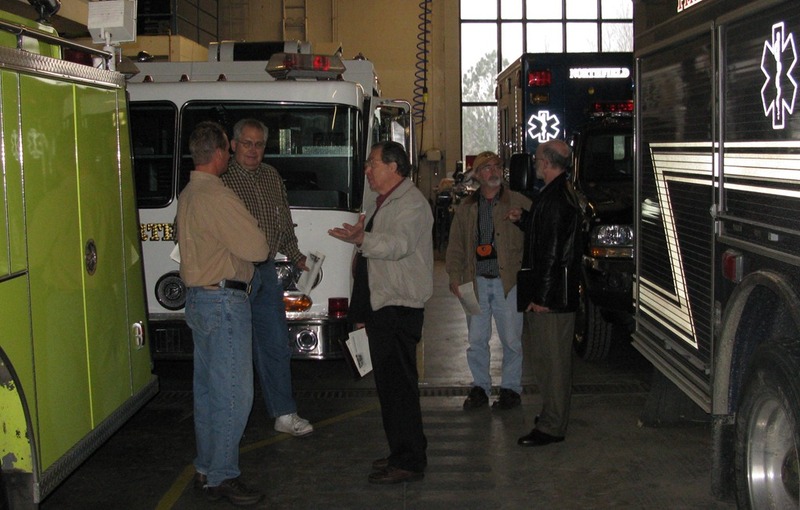 At some point we heard that one of the needs for fire and police vehicles was heated garages because of the sensitive computer equipment those vehicles now have …. That’s enough questions for the new “PR Dept” of the city to answer now, IF it so chooses. David, it seemed to me that several weeks ago, the underlying assumption was that there would be a May vote on funding the safety center replacement, and in anticipation, tours and other educational efforts had been put in motion. However, there hasn’t been a real discussion about the pros and cons of referendum vs council decision to sell bonds, much less what the timing of a referendum would be and last night nothing was said about gearing up for a campaign to put funding the safety center components. Now that the 2 components of the safety center will be phased, I wonder whether the bonding will be phased as well. I would have voted for Ray Cox’s minority report – reuse of the building for police and build a new fire hall. I have to believe the building could be retrofitted for less than razing it and rebuilding will cost. That plan also would have eliminated the need for an interim location for the fire department equipment. Apparently, maintaining the “central” location of the fire hall won out. As my councilman, Jon Denison has said, the council pretty much ignored their task force’s recommendations. Jane: It seems that with both the attorney selection and the Safety Center, the decision was predestined. With both decisions, there was a fairly substantial opposition and almost no public support, yet the Council plowed ahead. I don’t understand. Let’s hope they at least put it to a referendum. Maintenance is a huge issue for public buildings. The ‘easy’ path is to not do it, then turn to the taxpayers and ask or tell them to buy you a new building. Building maintenance is one of main reasons I ran for the school board in 1987. It all started like this…. My son Tristan was wrestling in the kids program as an 8 year old. We were between matches in the high school on a very wet spring day. As we waited in line to get a hot dog or some other equally exciting lunch we had to snake around puddles on the floor that were marked with wastebaskets so people wouldn’t slip in the water. While I was standing in line a ceiling tile got so soggy it plopped to the floor, splashing water on those of us standing hearby. The guy ahead of me remarked to his friend “Boy this school is a dump. I remember when Northfield had nice schools.” I then talked to him. He was from some small district to the south…Dover-Eyota I think. I said I was tired of the school board ignoring facilities and he convinced me to run for election to the board. I stayed on over 15 years, always making sure I was a good steward to the buildings and grounds the taxpayers built for us. With all that said, maintenance is a significant issue to consider when considering adding new facilities to the city. We all have to be assured that they have the understanding to take care of what we purchase for them. This means they must keep in in good repair, keep it available to the public, and keep it safe for those that use it. I believe we deserve answers about deferred maintenance of the safety center. Who made decisions not to maintain it? As I’ve said to several groups, it is important to remember that Greenvale Elementary school was constructed at the same time as the current safety center, and the High School was constructed about 5 years before it. Both school buildings are going strong, have been appropriately maintained, and should serve the taxpayers well for decades to come. Not maintaining a building is a decision that is made….it doesn’t just happen. I believe you are the only participant in this conversation who served on the city council for a brief portion of the 20 year period in question. Can you address Ray’s question of who made decisions not to maintain the Safety Center? Do you recall the issue of maintenance coming up while you served, and if so, what rationale was offered to defer? Maybe Dixon Bond would be good to ask since he was on the Council quite a while. Since I know you are diligent about attending city meetings in person and reading materials for yourself, let me invite you to tour the building instead of relying on others’ reports of how the space is used. Except for the Emergency Operations Center, which by definition is set up for use only in emergencies, and the training rooms for the police and fire departments, there is very little unused space in the building. If you would like to see for yourself, I would be happy to arrange a tour. The decision to replace the current structure certainly reflects the Wold study of the building, which enumerated a long list of items to be replaced or repaired. Even that study dealt with only the most obvious deficiencies. It didn’t get into the nitty gritty of the structural integrity of the building, one way or another. I don’t believe Ray Cox or Jerry Anderson have ever claimed to have “conducted evaluations of the structural soundness of the current building.” (Ray, since I know you’re reading, feel free to correct me if I’m wrong about that.) I know they have definite opinions as to whether or not it could be renovated, but I don’t think either one of them have made any engineering claims at all. As recently as last week’s tour, Jerry said he hadn’t seen the architectural plans. Even Ray acknowledged that there are at least a couple of million dollars of maintenance and replacements to be made before we get to the cost of renovating to meet our public safety needs. The way the Wold report described the building reminded me of a 1987 Plymouth minivan we used to own. It wasn’t very stylish, but it ran well enough. When it was about 18 years old, it hit a point at which several things failed at once: it need a new transmission, new brakes, new tires and the heater stopped working. The body had several rust spots. I asked Larry Churchill if it could be repaired. He said that, yes, it could all be fixed, but that if I did everything, I’d spend a boatload of money, and I’d still have an 18 year old minivan. Not a smart investment. It took money out of his pocket, but I always appreciated Larry for looking out for his customer’s long-term interest, not the quick fix. The appropriate approach is to build into the budget the cost of an endowment that will fund the maintenance of the building over its expected life. This isn’t that hard to do in terms of the math. The ‘problem’ is then that people will see what a new building really costs in present value terms, which is substantially more than only the construction cost. Transparency has a way of making things more difficult for those who want something. So, you are not likely to ever see the true present value cost of a new building ever quoted. You might even throw in the opportunity cost of what you don’t do with the funds that you use on a new building…but that gets more complicated. Back when I was on the council, when the City was looking to build a new hospital, we had an opportunity to have that hospital built by another group, who would then have also paid for its maintenance and would have paid a substantial sum to the City for ownership of the hospital, freeing a large amount of cash for the City. I advocated that the funds from that sale could have been used to create an endowment to maintain other City buildings, thereby reducing the tax burden on homeowners. Randy: It’s not clear to me what is considered “deferred maintenance”. That term seems more like a PR stunt than reality. I really didn’t see much on the tour that I would consider deferred maintenance. Simply put, for the past twenty years or so, the city has not made any significant investments in this building. About $3.2 million in deferred maintenance and other repairs will be required just to bring the building up to code for continued service. but it doesn’t provide detail. I do remember “new roof” being mentioned someplace. Randy, can you find the deferred maintenance details in one of the documents on one of the Safety Ctr pages on the City’s website? Griff: My understanding was that any remodeling would require code compliance. That isn’t deferred maintenance. Ray Cox mentioned that the entire remodeling could be done for about the same price as the “deferred maintenance”. Randy you are correct, I have not seen an engineering report on the current safety center. The only thing I’ve seen is a list that Wold prepared and it simply had line items and figures. I seem to remember one of the items was $1.9 million for a new HVAC system. So when you toss that level of things into a list, the list can get expensive rather quickly. I think their ‘deferred maintenance’ list was $3.2 million. I continue to focus on the fact that I firmly believe the existing facility can be remodeled nicely and cost effectively into a police only facility. I base this statement on my 37 years in the building business performing similar projects, not on any engineering study. But I also continue to be very concerned to think that a public building, constructed to very high standards using top quality materials is going to be a candidate for the scrap heap in just 40 years. Somehow that doesn’t square with me. If that is truly the case that Northfield wants to make, then I think we have a very serious case of constructing a simple span pre-engineered steel building for a permanent home for the police and fire departments. That way we won’t spend anywhere near $10 million, and it will be much easier to tear down in 40 years. Ray : Great perspective… If we have to build a building that we can’t afford, or have a referendum that will not pass because of the cost, because we are too “special” to have the least expensive building that will fill the needs of the police and fire depts. , then we are a foolish bunch indeed. A building such as you describe is fine with me, and I’m sure with a lot of others too.. after all the building does not put out fires or protect the community… the people and equipment do that. I want them to have the space and equipment to function at their best, and I could care less about the building, ( and besides, Jay Jasnoch could make it beautiful with the most purely functional industrial components.). The worst outcome, IMO, would be to plan too high a cost, have the public reject it, and then have no new facility when there is need. It is unacceptable to not have an accurate cost analysis, of the repairs and upgrades necessary, including the possible addition on the south end of the current building if needed (that being shown in the 9.21.07 Hay Dobbs report). Until that happens, and with numbers that are accurate… not the inflated presumptions that we had with the liquor store … the public is not going to be convinced that the council, and especially the staff, have done their job. It must be said , that with all the threats of the direst “mismanagement” a council can commit is the “micro-management” of the staff, how difficult it seems to be for them to ask all the questions they should be asking. They must constantly remember who is the employer, and who is the employee, and who they, the council, represent. Clear relationships are always better than murky ones.